Imagine if educators could virtually connect to Earth’s Polar Regions giving their students first hand experiences with scientists and scientific data. What if students could utilize the ever-expanding polar data streams and scientific observations happening at higher latitudes? What if scientists could connect with broader audiences more effectively to communicate their polar research and findings? Our mission is to connect Polar scientists with broader audiences to further the impact of their research, while connecting educators and students with data and cutting edge science. We engage students in understanding how polar regions influence our lives while improving our understanding of how scientists work to understand a changing climate system. Polar-ICE pairs educators and scientists in partnerships that are win-win. 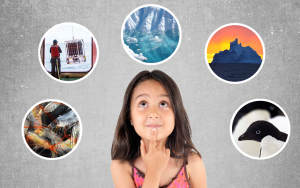 Scientists contribute to public education and share their research and understanding of the changes in climate, food webs, and human culture in the polar regions. Educators share their knowledge of science communication and effective practices in reaching young audiences, while also learning more about polar research and the process of science to bring to their students. Together educators and scientists will create excitement and contribute to the necessary skills required to meet 21st century workforce needs. Connect polar scientists with broader audiences. Approximately 60 polar scientists enhance their skills in: deconstructing and decoding science for non-expert audiences; and the art of telling science stories. Scientists network with members of the formal and informal education community. Share our lessons learned. We are exploring the evidence of student engagement in Polar ICE data-focused classroom activities.